Conveniently located along the stretch of National Road No.6, Krorma Yamato guesthouse is a mere 5-minute walk away from other popular local guesthouses such as Cheng La and Takeo (a popular destination for backpackers). It is also a mere 10-minute drive away from the city center, a 15-minute drive away from the Angkor Temples and at least 20 minutes away from the International Airport. Convenience stores and various shops are located along the area as well. 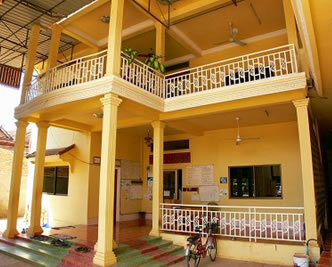 Room rates start from USD 2 up to USD 16 per night. Each room comes with a standard hot water shower facility, a TV and DVD set plus a complimentary Japanese Krorma Travel Guidebook for your convenience. (except in dormitory room) Fan and Air-conditioned room options are available. Clean, safe and affordable! Lodging has never been this easy and relaxed. Krorma Yamato Guesthouse is also offering various budget friendly ala-carte tour packages (tour guide to be arranged separately) and various optional itineraries conveniently prepared to fully customize you travel needs. Highly recommended for people who travel alone or within groups, our tour packages will surely fit whatever type of adventure you and your friends may wish to venture into. For a more comfortable stay, our guesthouse also provides you with a small café restaurant that serves a variety of Cambodian and Japanese meals at very reasonable prices. Open to both in-house and outside guests, this café serves breakfast, lunch and dinner. This café also offers a wide selection of magazines and Japanese comic books for you to enjoy during your stay with us. We also have a tour information desk to assist you with whatever travel need you may require and of course, a free Wi-Fi service is also being offered. Krorma Yamato Guest House in larger map.